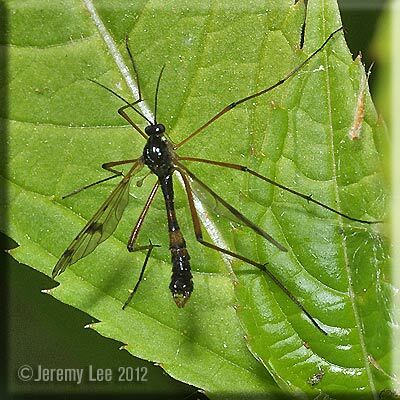 Ptychoptera contaminata, more commonly known as a Crane Fly, is a member of a small and distinctive family which only has about seven species in it. The scientific name Ptychoptera refers to their 'folded' wings, i.e., a crease in the wing that can make the wing appear very narrow. The abdomen is mainly black with a small amount of orange, the 'thighs' are also orange in colour. The clear wings have a number of darker dots and these are larger towards the centre of the wings. They frequent water margins and marshy areas and the adults are to be seen flying from May to October. Larvae are aquatic, living in mud and litter in shallow water. They resemble long thin terrestrial 'leather jackets' with long breathing tube tails that extend to the surface of the water. Fairly frequent and widespread in England and Wales.